Tory ministers are considering drastically cutting the main Employment and Support Allowance sickness (ESA) benefit, internal documents seen by the BBC suggest. New claimants, judged to be capable of work with appropriate support, could be given just 50p more per week than people on job seekers allowance. Current recipients get almost £30 per week more. This is to meet additional costs that arise because of a person’s disability. The documents reveal that the government has also been forced to hire extra staff to clear the backlog on the benefit. Some 100 healthcare professionals are being hired to carry out fitness-for-work tests. The staff, who will be employed through the Pertemps agency, will help to reduce a backlog of more than 600,000 cases. They will be in addition to any extra staff brought in when a new contractor is announced shortly to replace ATOS. The American firm, Maximus, has been awarded the contract. Controversies and scandals have been unearthed by UK researchers since Maximus was handed the lucrative contract in July to deliver the government’s new health and work service in England and Wales. Leaked documents over the summer showed that ministers considered ESA – formerly known as incapacity benefit – to be “one of the largest fiscal risks currently facing the government”. They also revealed “concerns” about claimants moving off jobseekers allowance onto ESA. Giving consideration to cutting the differential paid to ESA recipients in the Work Related Activity Group (WRAG) – individuals who have to prepare for employment – is a reflection of that concern. However these are people that have been declared unfit for work by their doctor. They currently receive £28.75 more per week but the documents show plans are being discussed to cut that to just 50p more than jobseekers allowance. People receiving JSA, who are aged 25 or over, currently get £72.40 per week. However, disabled people do have have additional needs and higher living costs, which is why ESA was set at a higher amount than JSA. Furthermore, because ESA is paid to people who can’t work, that means they are potentially reliant on benefit to meet their living costs indefinitely, and certainly longer term than those claiming JSA. ESA wasn’t designed to be such a temporary means of support as JSA was. Employment and Support Allowance is paid to approximately two million people. Claimants have to undergo an extremely controversial Work Capability Assessment (WCA) to determine whether they are eligible and at what level. Many people have been wrongly assessed as fit for work, and have been forced to appeal in order to receive the benefit that they are entitled to, and the high success rate of appeals in itself indicates that the WCA is deeply flawed. People have died within weeks of being told they are fit for work, also indicating that this assessment process is heavily weighted towards ensuring that sick and disabled people lose their lifeline benefit. Of course the Conservatives have used the word “reform” as a euphemism for severe cuts since 2010. Dame Anne Begg MP‏ has recently called again for a cumulative impact assessment during debate on government’s policies towards disabled people. She has also fought to keep the the Independent Living Fund that supports around 21,000 people with severe disabilities to help them live independently at home has also been closed to new applicants, and will be shut down completely by 2015. This is despite a court ruling in May that stated closure of the fund is unlawful, as it breaches the Equality Act 2010, which was introduced by the Labour Party. Disabled people needing social care are targeted 19 times more than most citizens. Further cuts to benefits are neither feasible nor justifiable. “When Labour created the Work-related Activity Group in 2008, the rationale was to ensure that sick and disabled people who couldn’t work in the short term but might be able to in the future weren’t simply written off. Those in this group would receive support from Jobcentres and be encouraged to do appropriate training. However we were clear that up until their next reassessment – which would occur at least every two years – these people were still unable to work. This is something Tory Ministers now seem keen to ignore. By cutting payments to those in the Work-related Activity Group by nearly £30 per week, Ian Duncan Smith is effectively saying that these people are only a hop, skip and a jump away from being a fully fit, able-bodied Jobseekers Allowance claimant. I suggest that the government looks at reducing the £107,000 each per annum that the Tories have awarded to millionaires in the form of a “tax break”, using money taken from the public purse. Cameron pledged in 2010 that only those with the “broadest shoulders” would be expected to carry the burden of austerity cuts. Perhaps he needs someone to explain to him that this doesn’t actually mean handing out tax payers’money to millionaires, whilst savagely cutting vulnerable people’s lifeline benefits and services. After all, it’s not millionaires that are losing their dignity, health and well-being. Living in desperation is pushing the most vulnerable people to join the queues at food banks. Diseases associated with malnutrition, which were very common in the Victorian era in the UK, became rare with the advent of our welfare state and universal healthcare, but they are now making a reappearance because of increasing numbers living in absolute poverty. This is a direct consequence of Coalition policies, which basically take money from the poorest and provide generous handouts to the wealthy. Many are now below the breadline. Chris Leslie MP, Labour’s Shadow Chief Secretary to the Treasury points out that the Coalition have raised taxes 24 times. Whilst millionaires have been given a huge tax cut, ordinary people are paying more because the Tories have raised VAT and cut tax credits and other benefits. “Independent figures from the IFS show that by next year families will be at least £974 a year worse off because of tax and benefit changes since 2010″. Meanwhile, the cost of living continues to rise, and Cameron still won’t rule out raising VAT again to pay for £7 billion of unfunded tax promises. The Conservatives aim to dismantle our welfare state and National Health Service. They have already drastically cut public services and provisions down to the bare bones. Their regressive ideology is all about looking after those who don’t need support – the very wealthy – at the expense of the poorest. We did have better, we evolved and we recognised that anyone could become vulnerable at some point during their lifetime, through no fault of their own. Illness, accident, losing a job – these are events that may happen to anyone. So we each paid for our own provision to ensure that everyone is supported if they need it. And that is in our human nature: to want better for each generation, to evolve and make progress as a society. This is the lesson that we need to teach the Tories, once and for all. They invent problems and maliciously scapegoat the poor to justify their dislike and resentment of our supportive provisions and to justify dismantling them. Yet our public services and support, owned by us for us, ought to be a source of pride, and we mustn’t let them get away with taking it all away. it certainly looks like the the fightback for the disabled isn’t over. It’s like living in a nightmare version of a Christmas Carol, where scrooge (AKA the government) get worse and their robbing of the poor/disabled descends into a Hieronymus Bosch style nightmare. 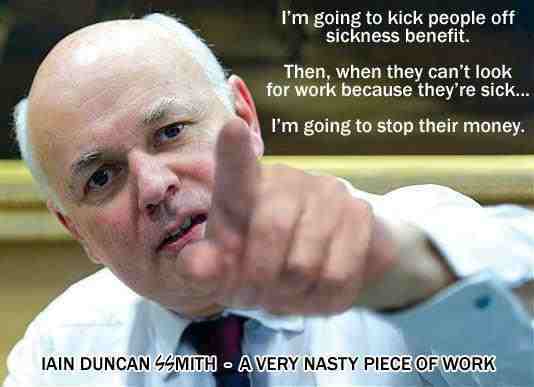 Duncan Smith is more than just a nasty piece of work, he is a thoroughly dishonest and corrupt nasty piece of work. It is just another sickening blow to the poor sick and disabled, the sick and disabled especially. Most of those in receipt of ESA in the work group are mostly unfit for work in the first place, being forced to do volunteer work or training no matter the cost to their already worsening health situation. It is just another way of punishing them for being sick. When will this government learn that being supportive of these people is better than being punitive. they just pulled the article from the bbc website…. The government is determined to kick everyone off ESA. By reducing ESA to the same level as JSA they are effectively scrapping it. They would start building workhouses but it was pointed out that we would have to be moved again after the next round of benefit cuts, food bank vouchers not accepted for rent. It is post election now and the same people are still pulling the strings of power.The amount of people who are disabled and struggle are expected to work full time.my friend who is almost totally blind was sanctioned after he tried to explain he couldn,t do 90% of the employment on offer due to his visual impairment. The system is now geared up to sanction and target vulnerable people the system needs an overhaul and become realistic.